Fine tune your sewing expertise and boost your creativity with the Juki Exceed Series Electronic Workbook.This workbook covers the basic to advanced features of the Exceed machines and how to make the most out of the included accessory presser feet and optional accessory presser feet. Juki has load one test page above so you can see what the instructional information is all about. 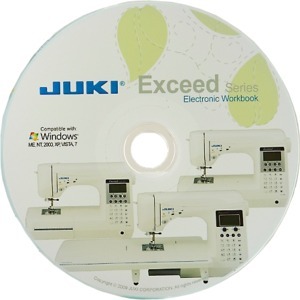 The Juki Workbook For Exceed F-300 F-400 F-600 Sewing Machines is digital on a CD and provides detailed, step-by-step sewing instruction, full color images and sewing tricks and tips. Learn how to, insert an invisible zipper with ease, create perfect corners and curves for any applique pattern, create decorative borders, twin needle sewing techniques, free motion quilting techniques, patchwork techniques and more with this informative workbook. Juki Have created this guide to help you explore the endless sewing possibilities of your JUKI Exceed Sewing machine. This sewing workbook intended as a supplement to your sewing machine instruction manual, covering topics such as practical stitches, machine accessories, working with special fabrics and threads, decorative sewing techniques and quilting techniques. To obtain the maximum benefit from this workbook, we encourage you to practice the techniques shown. You can attach your sample in the spaces provided at the end of each section and use your sample as a reference whenever necessary. We hope that you find this workbook a useful aid in learning all the features of your Juki Exceed sewing machine. My husband recently gifted me the Juki F600 sewing machine. I am extremely pleased! He also purchased a number of items to go along with the machine. One of which was the electronic workbook CD. I put it in my computer and it did not work. Low and behold it is only for Windows machines and not Apple computers. While this is a minor problem, I just wanted you to be aware of this as no where on your product description for this item is this pointed out. As many people do us Apple products and computers, I do not want this to happen to anyone else. FYI: I use a MAC Pro and they don't come with CD's. Wish I had a way to view the CD !